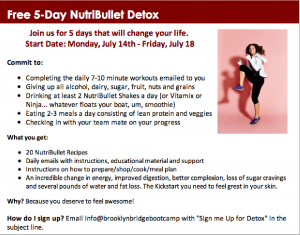 L.A. Brooklyn Bridge Boot Camp | Join our FREE 5-Day NutriBullet Detox starting Monday! 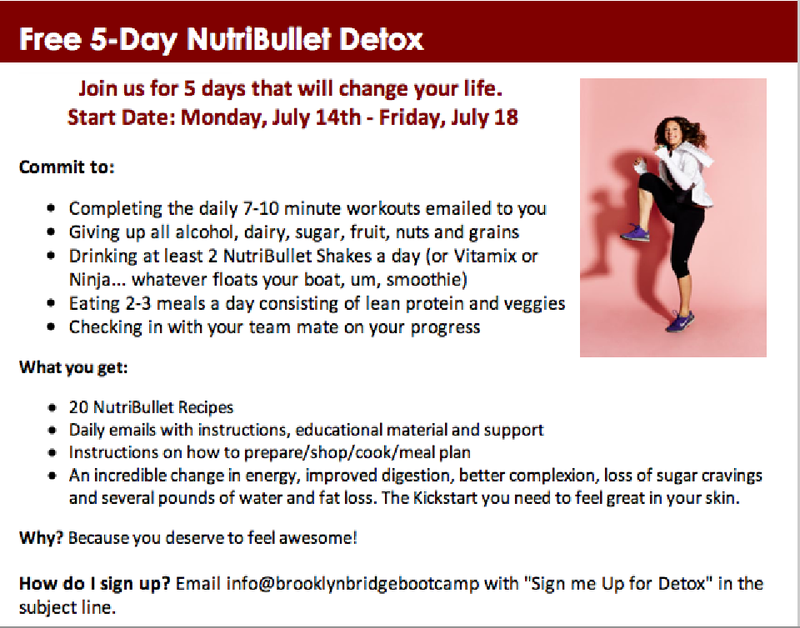 var scss_share_image=""
You are here: Home / Blog / Uncategorized / Join our FREE 5-Day NutriBullet Detox starting Monday! Join our FREE 5-Day NutriBullet Detox starting Monday! Join our FREE 5-Day NutriBullet Detox. Five days to learn what works for your body and what doesn’t. Five days can create incredible changes if you’re ready to be committed. This program is not for the uncommitted or those just looking for another diet or quick fix. If you follow the instructions and give yourself the chance to truly change just for 5 days, you’ll discover that you’ll never want to go back to your old ways. Sign up by Friday 12pm. I’m in; let’s do this! hi! I look forward to the 5 day detox!!!! Can’t wait to participate and give my body a good jump start to more healthy living! This like giving up breathing but ready. Got it and I’m ready for this!!! 10 Choices you will regret in 10 years Eggs 20 Ways!